Thane City was known as Shreesthank. The first ever local railway train in India was started on 16th April, 1853 from Boribunder to Thane. Thane district is divided into three parts known as costal zone, hilly track and urban zone. 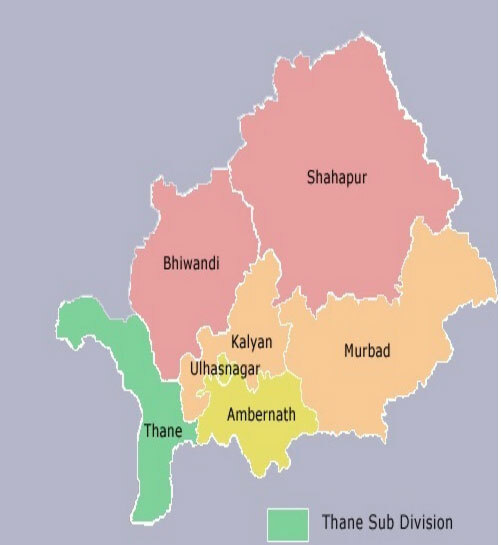 There is highest tribal population in Thane district. e.g. 6 municipal corporations, 2 municipal councils, CIDCO, MMRDA, MIDC etc. Thane district is well known for highest revenue collection. There are 3 Members of Parliament & 18 Members of Maharashtra Legislative Assembly. There are highest irrigation projects in Thane district. Shahapur tahsil is known for irrigation projects. There is also Central Govts ammunition factory situated at Ambernath. Bhiwandi city is famous for power looms industry. The Maharashtra Industrial Development Corporation has developed 10 industrial area in the district. Three national highways and three railway tracks is existing for communication. There are Hajimalang, Gorakhgad, Mahuli etc. ancient forts in Thane district. See world map below. If Thane looks smaller in the world map, imagine how small it will be in the Universe.